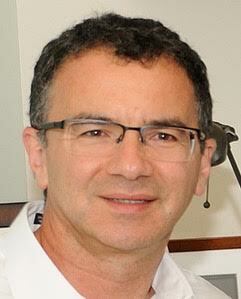 Work in the Nabi lab focuses on the cell biology of cancer and the use of super-resolution microscopy to study cellular domains. 1) The role of non-caveolar scaffold domains and the galectin lattice in cancer cell migration and focal adhesion tension. We study the role of plasma membrane domain effectors galectin-3 and caveolin-1 in focal adhesion dynamics and tension in metastatic cancer cells. We have developed network analysis of dSTORM super resolution microscopy to define the molecular architecture of caveolae and scaffolds and are now studying the structural changes in these membrane domains associated with tumor cell migration and mechanical stress. Our characterization of the proteome and transcriptome of tumor cell pseudopodia has identified multiple pseudopod-localized effectors whose role in pseudopod-specific actin dynamics and focal adhesion tension is being studied. 2) The role of the cancer-associated ubiquitin ligase Gp78 in the regulation of endoplasmic reticulum-mitochondria contacts and mitophagy. We have defined the role of Gp78 (also known as autocrine motility factor receptor (AMFR)), a cancer-associated receptor and E3 ubiquitin ligase in endoplasmic reticulum (ER) associated degradation, in ER-mitochondria interaction and mitophagy. We have shown that Gp78 and its ligand AMF control rough ER-mitochondria contacts and are defining the underlying molecular mechanisms and applying STED super-resolution microscopy to define the organization of the ER and its interaction with mitochondria. Li L*, Gao G*, Shankar J, Joshi B, Foster L, Nabi IR*. (2015) MAP Kinase-dependent phosphorylation of the Gp78 E3 ubiquitin ligase controls ER-mitochondria association and mitochondria motility. Biol. Cell 38. PMID 26337390 [IF 4.5]. Wang PT, Garcin PO, Fu M, Masoudi M, St-Pierre P, Panté N,Nabi IR*. (2015) Distinct mechanisms controlling rough and smooth endoplasmic reticulum-mitochondria contacts. J Cell Sci 128, 2759-65. [IF 5.4]. Meng F, Joshi B,Nabi IR*. (2015) Galectin-3 Overrides PTRF/Cavin-1 Reduction of PC3 Prostate Cancer Cell Migration. PLoS One 10, e0126056. [IF 3.2]. Halwani Y, Kojic LD, Chan SK, Phang TP, Masoudi H, Jones SJ,Nabi IR, Wiseman SM (2015) Prognostic significance of autocrine motility factor receptor expression by colorectal cancer and lymph node metastases. Am J Surg 209: 884-9. [IF 2.3]. Garcin PO, Nabi IR, Panté N. (2015) Galectin-3 Plays a Role in Minute Virus of Mice Infection. Virology 481:63-72. [IF 3.3]. Shankar J, Nabi IR*. (2015) Actin cytoskeleton regulation of epithelial mesenchymal transition in metastatic cancer cells. PLoS One 10: e0119954. [IF 3.2]. Shankar J, Boscher C, Nabi IR*. (2015) Caveolin-1, galectin-3 and lipid raft domains in cancer cell signalling. Essays Biochem 57:189-201. [IF 2.8]. Boscher C, Nabi IR*. (2013) Galectin-3- and phospho-caveolin-1-dependent outside-in integrin signaling mediates the EGF motogenic response in mammary cancer cells. Mol Biol Cell 24: 2134-45. [IF 4.5]. Shankar J*, Kojic LD*, Pierre P*, Fu M, Wang PTC, Joshi B, Nabi IR*. (2013) Raft-Dependent Endocytosis of Autocrine Motility Factor Regulates Gp78 Ubiquitin Ligase Activity via Rac1. J. Cell Science 126: 3295-304. [IF 3.2]. Fu M, Pierre P, Shankar J, Wang PTC, Joshi B, Nabi IR*. (2013) Regulation of Mitophagy by the Gp78 E3 Ubiquitin Ligase. Mol. Biol. Cell 24: 1153-62. [IF 4.5]. Donatello S, Babina IS, Hazelwood LD, Hill AD, Nabi IR, Hopkins AM. (2012) Lipid Raft Association Restricts CD44-Ezrin Interaction and Promotion of Breast Cancer Cell Migration. Am J Pathol. 181: 2172-87. [IF 4.6]. Joshi B, Bastiani M, Shankar J, Strugnell S, Boscher C, Parton RG, Nabi IR*. (2012) Phosphocaveolin-1 is a Mechanotransducer that Induces Caveola Biogenesis via Egr-1 Transcriptional Regulation. Cell Biol. 199: 425-435. [IF 9.8]. Lin PJ, Tam YYC, Hafez I, Sandhu A, Chen S, Ciufolini MA, Nabi IR, Cullis PR. (2013) Influence of cationic lipid composition on uptake and intracellular processing of lipid nanoparticle formulations of siRNA in a macrophage cell line. Nanomedicine 9: 233-46. [IF 5.4]. Fairbank M, Huang K, El-Husseini A, Nabi IR*. (2012) RING Finger Palmitoylation of the Endoplasmic Reticulum Gp78 E3 Ubiquitin Ligase. FEBS Letters 586: 2488-93. [IF 3.2]. Shankar J, Wiseman SM, Meng F, Kasaian K, Strugnell S, Mofid A, Gown A, Jones SJ, Nabi IR*. (2012) Coordinate expression of galectin-3 and caveolin-1 in differentiated thyroid cancer. Pathol 228: 56-66. [IF 7.4]. Boscher C, Zheng YZ, Lakshminarayan R, Johannes L, Dennis JW, Foster LJ, Nabi IR*. 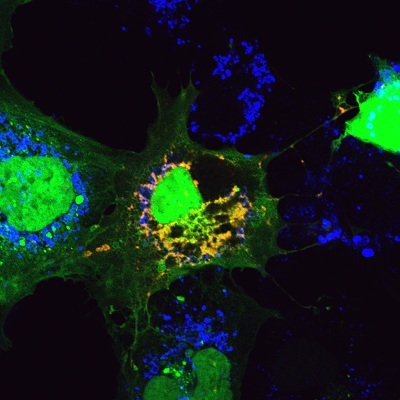 (2012) Galectin-3 protein regulates mobility of N-cadherin and GM1 ganglioside at cell-cell junctions of mammary carcinoma cells. J Biol Chem 287:32940-52. [IF 4.6]. Pierre P, Dang T, Joshi B, Nabi IR*. (2012) Endoplasmic Reticulum Domain Localization of Gp78-mediated Ubiquitin ligase activity. J. Cell Sci 125: 1727-37. [IF 6.4]. Zheng YZ, Boscher C, Inder KR, Fairbank MR, Loo DR, Hill MM, Nabi IR*, Foster LJ* Differential impact of caveolae and caveolin-1 scaffolds on the membrane raft proteome. (2011) Cell. Proteomics 10: M110.007146. [IF 8.4]. Zhang M, Lee SJ, An C, Xu JF, Joshi B, Nabi IR, Choi AM, Jin Y (2011) Caveolin-1 mediates Fas-BID signaling in hyperoxia-induced apoptosis. Free Radic Biol Med. 50: 1252-6. [IF 5.7]. Fu M, Li L, Albrecht T, Johnson JD, Kojic LD, Nabi IR*. (2011) Autocrine motility factor regulates ER stress and cell death through control of ER calcium release. Cell Death Diff. 18: 1057-70. [IF 9]. Shankar J, Nabi IR*. (2011) RNA Purification from Tumor Cell Protrusions Using Porous Polycarbonate Filters. Methods Mol Biol. 714:353-366. Albert MA, Kojic LD, Nabi IR, Dubreuil JD. (2011) Cell type-dependent internalization of Escherichia coli STb enterotoxin. FEMS Immunol Med Microbiol. 61: 205-217. [IF 2.5]. Grund S, Olsson B, Jernås M, Jacobsson S, Swolin B, Nabi IR, Carlsson L, Wadenvik H. (2010) The autocrine motility factor receptor is overexpressed on the surface of B cells in Binet C chronic lymphocytic leukemia. Oncol. 28: 1542-8. [IF 1.2]. Shankar J, Messenberg A, Chan J, Underhill TM, Foster LJ, Nabi IR*. (2010) Pseudopodial Actin Dynamics Control Epithelial-Mesenchymal Transition in Metastatic Cancer Cells. Cancer Research 70: 3780-90. [IF 7.5]. Chiu CG, Strugnell SS, Griffith OL, Jones SJ, Gown AM, Walker B, Nabi IR, Wiseman SM. (2010) Diagnostic Utility of Galectin-3 in Thyroid Cancer. J. Pathol. 176: 2067-81. [IF 5.7]. Joshi B, Nabi IR*. (2010) A role for KAI1 in promotion of cell proliferation and mammary gland hyperplasia by the Gp78 ubiquitin ligase. J. Biol. Chem. 285: 8830-9. [IF 5.3]. Dennis JW, Nabi IR*, Demetriou M. (2009) Metabolism, cell surface organization and disease. Cell 139: 1229-41. [IF 35.5]. Balgi AD, Fonseca BD, Donohue E, Tsang T, Lajoie P, Proud CG, Nabi IR, Roberge M. (2009) Screen for Chemical Modulators of Autophagy Reveals Novel Therapeutic Inhibitors of mTORC1 Signaling. PLOS One 4(9): e7124. [IF 3.7]. Lajoie P, Goetz JG, Dennis JW, Nabi IR*. (2009) Lattices, rafts and scaffolds: Domain regulation of receptor signaling at the plasma membrane. Cell Biol. 185: 381-5. [IF 13]. Fairbank M*, St-Pierre P*, Nabi IR*. (2009) The Complex Biology of Autocrine Motility Factor/Phosphoglucose Isomerase (AMF/PGI) and Its Receptor, the Gp78/AMFR E3 Ubiquitin Ligase. Molecular BioSystems 5: 793-801. [IF 4.2]. Lajoie P, Kojic LD, Nim S, Li L, Dennis JW, Nabi IR*. (2009) Caveolin-1 regulation of dynamin-dependent, raft-mediated endocytosis of cholera toxin-B sub-unit occurs independently of caveolae. J Cell Molec Med 13: 3218-2[IF 5.1]. Plasma membrane domain organization regulates EGFR signaling in tumor cells. 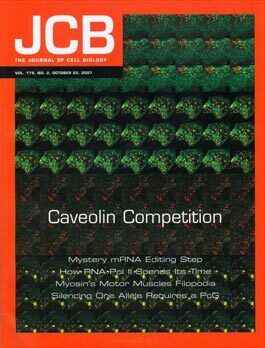 Cover image, Journal of Cell Biology 179, 2007. Expression of mutant dynK44A induces caveolae in ras-transformed NIH-3T3 cells. 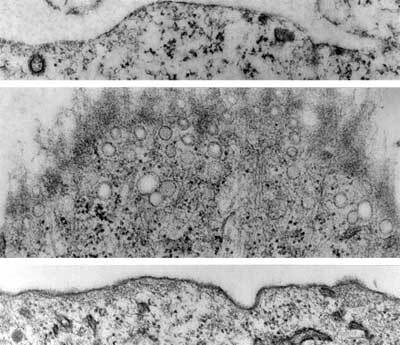 Ras-transformed NIH-3T3 cells exhibit few caveolae (top) but following adenoviral infection with mutant dynamin (K44A), plasma membrane profiles show the dramatically increased expression of smooth caveolar invaginations (middle). DynK44A-infected cells pretreated with 5 mM m CD exhibit no caveolar invaginations (bottom). Glycolipid rafts can therefore invaginate to form caveolae independently of caveolin expression. Le et al. J. Biol. Chem. 277, 3371-3379 (cover image).